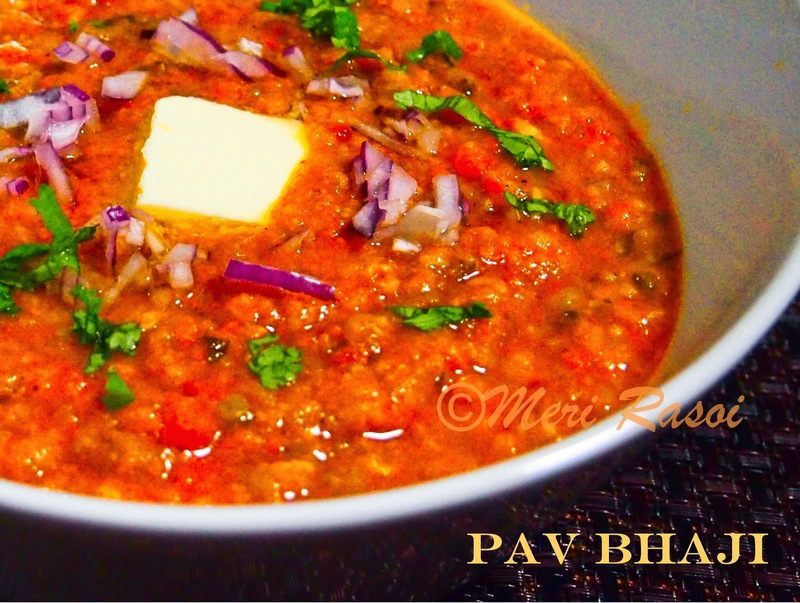 Pav Bhaji is a popular street food/ fast food that originated in Mumbai. 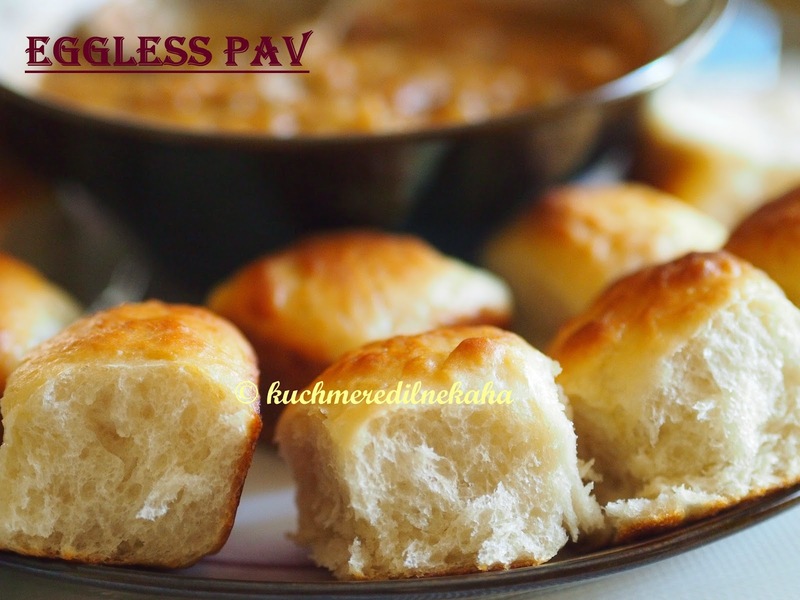 "Pav" is nothing but small bread rolls while "bhaji" is a mixed vegetable dish. 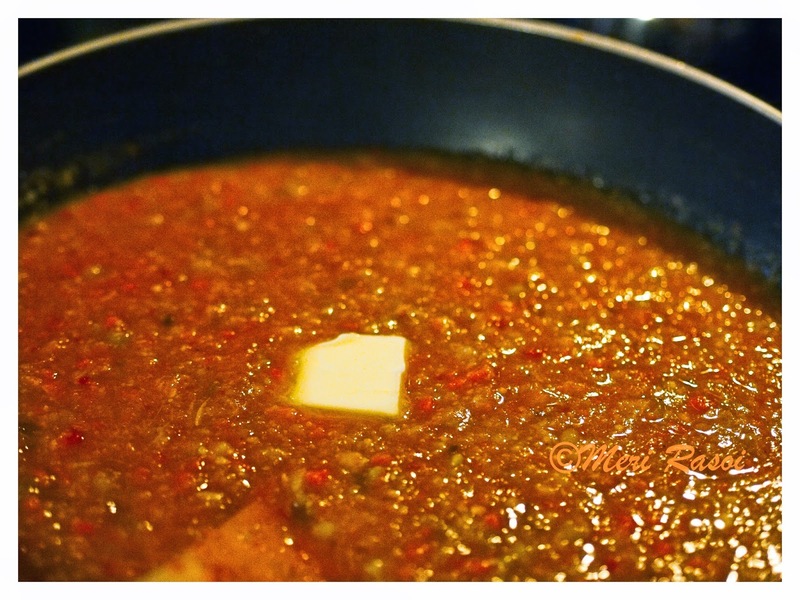 It is a well spiced dish with smoothly mashed mixed vegetables and a good amount of ripe tomatoes. The bhaji is served with a dollop of butter along with a buttered and toasted bread roll . 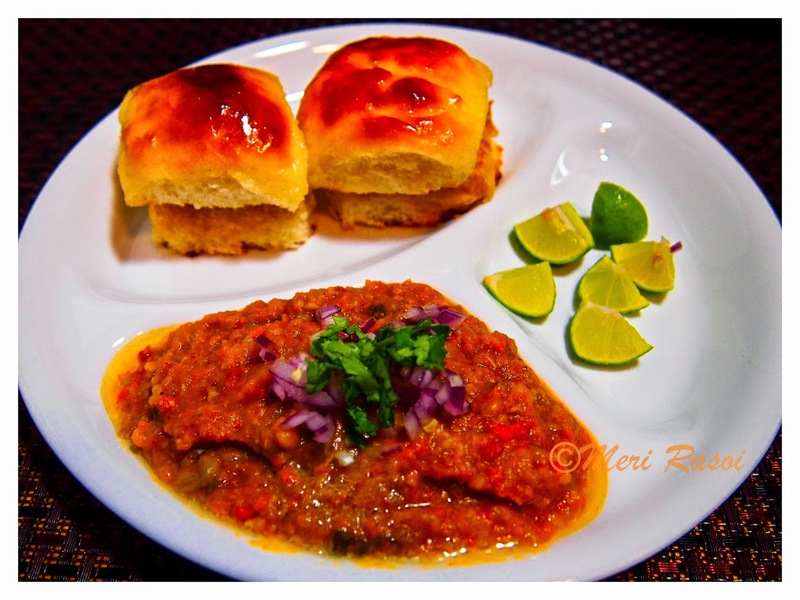 The most important thing for a Pav Bhaji to be a success is the consistency of the bhaji. 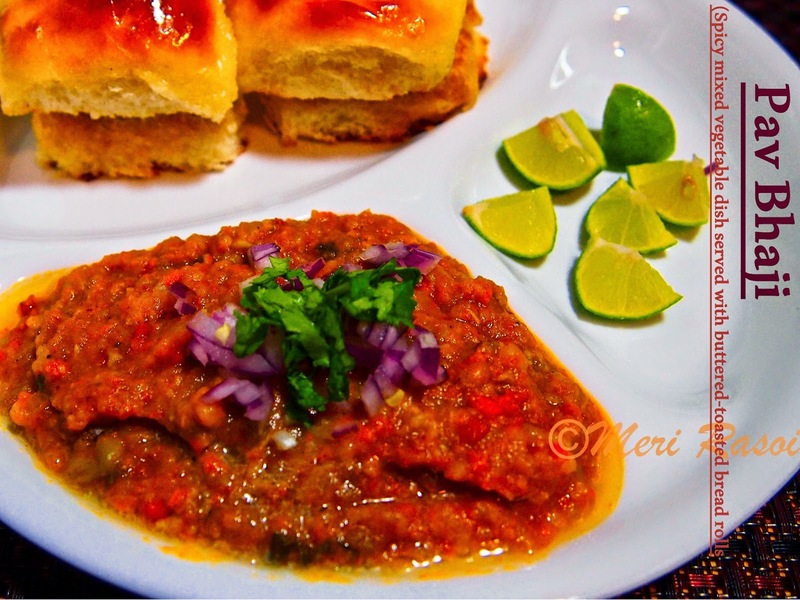 The vegetables need to be well mashed and it needs to be correctly spiced with the Pav Bhaji masala which is readily available in Indian stores. 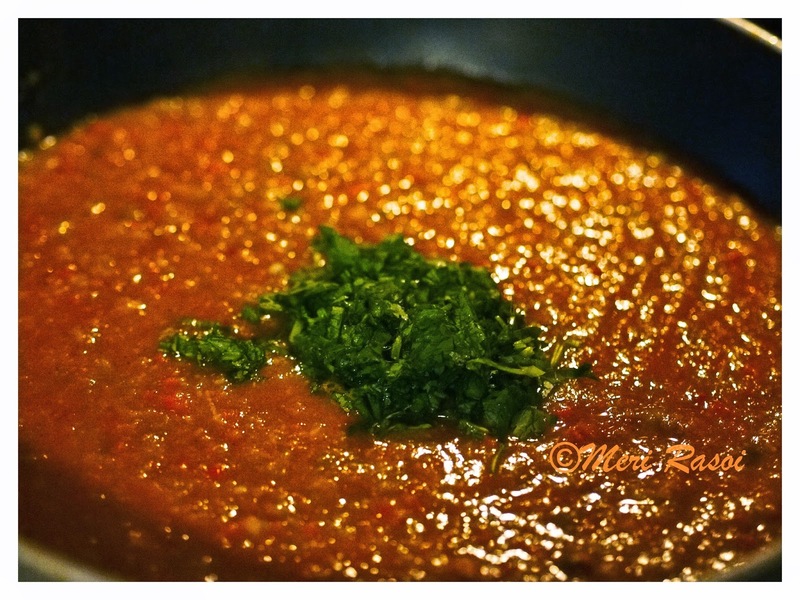 Its also important to use ripe red tomatoes as they will give the dish the nice red color. I like to use a generous amount of ginger and garlic . 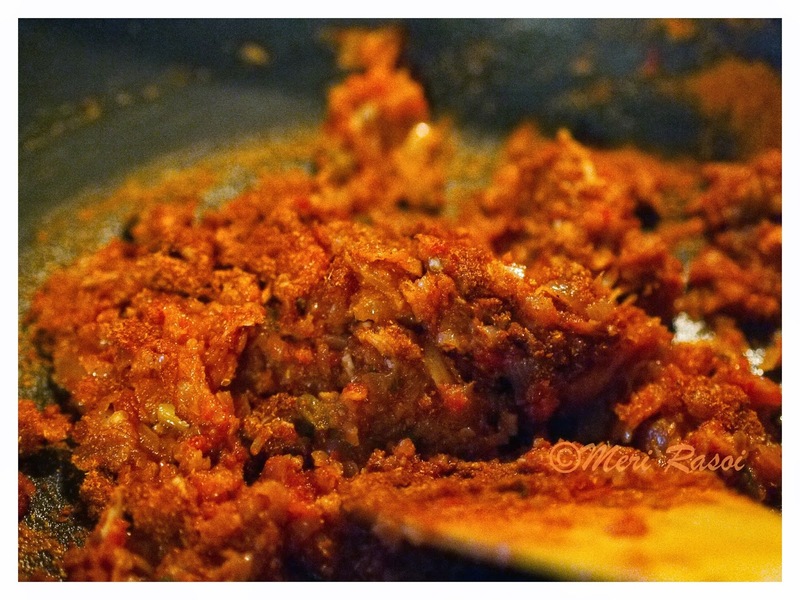 Also important is that the onion tomato mixture has to be cooked well. The dish should be the consistency as shown in the picture above. 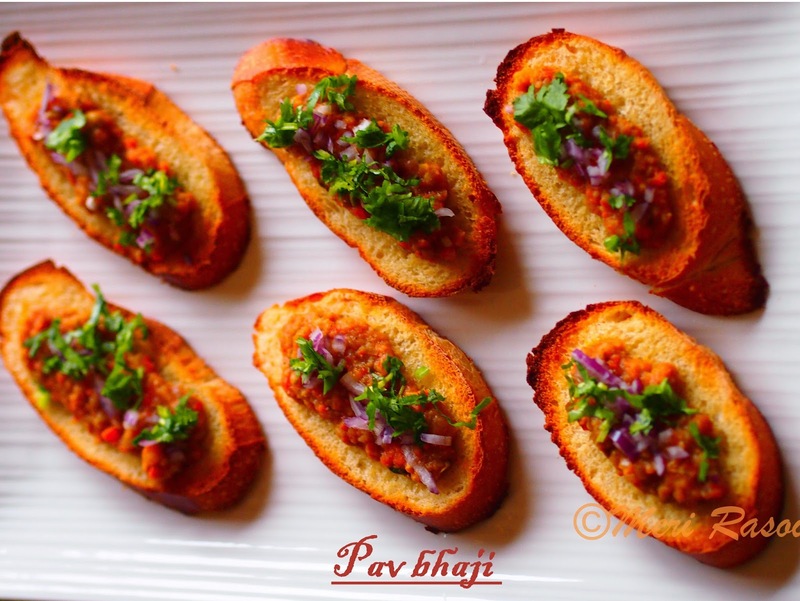 There are many variations to this dish like Cheese Pav Bhaji, Paneer Pav Bhaji , Jain Pav Bhaji etc. 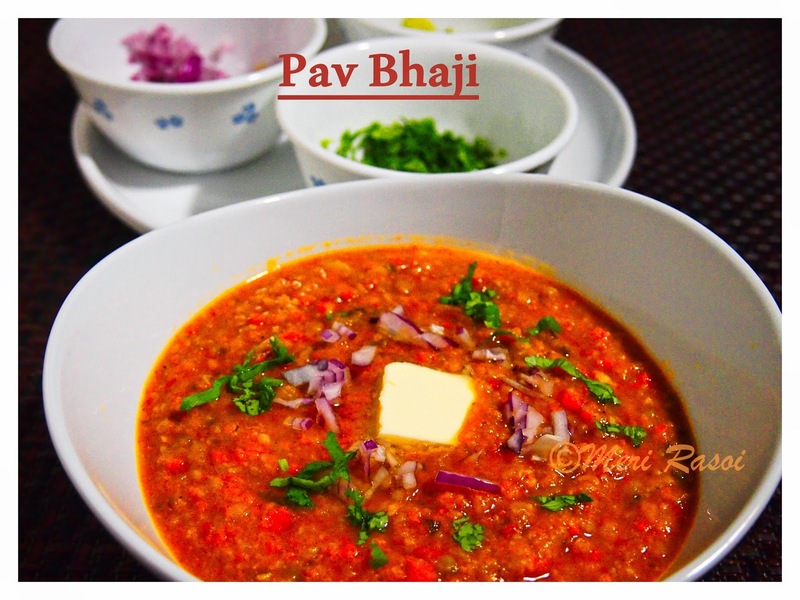 Today I am sharing with you the recipe to make the basic Pav Bhaji. Since I am not much of a writer, I have tried to use a lot of pictures to convey my message. 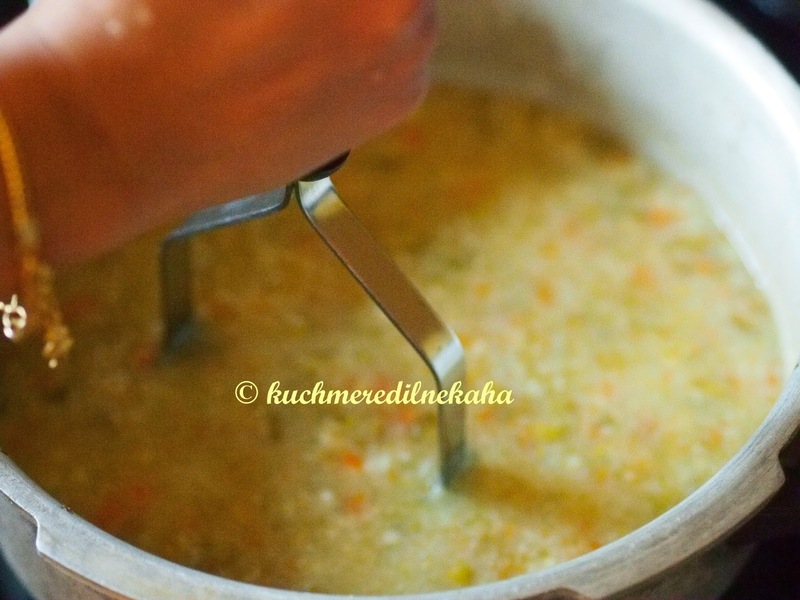 Take cauliflower florets, potatoes, green peas, bell peppers and carrots in a pressure cooker. Add some water and cook them. Once cooked, mash them well. Heat oil in a thick bottomed pan. 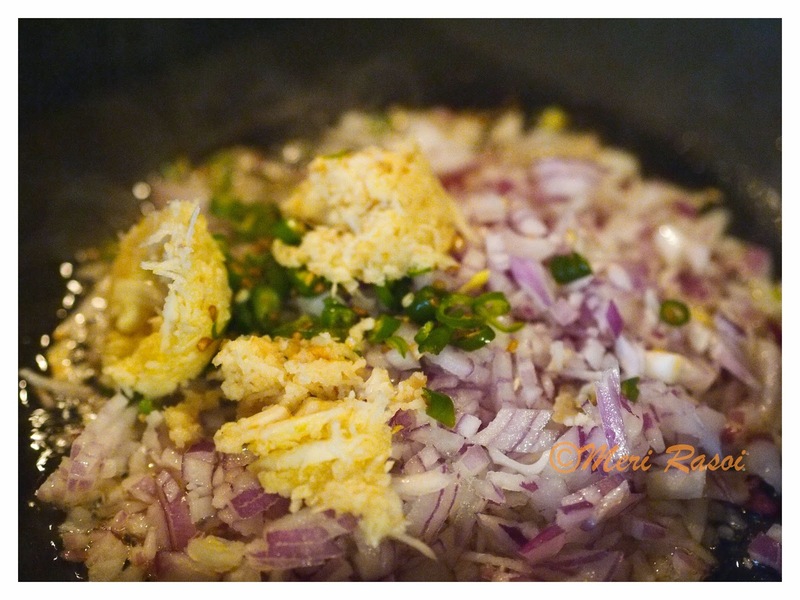 When the oil is hot, add the chopped onion , grated ginger, grated garlic and chopped green chillies. Fry until the onions turn translucent. Note: I generally add the onions first to the oil and then the ginger-garlic. The reason is, if you add the ginger garlic first and if the oil is too hot then it is likely that ginger and garlic will get burnt. That will give a bad taste to the dish. Hence I add onions first, that regulates the oil temperature. Then add the ginger garlic. 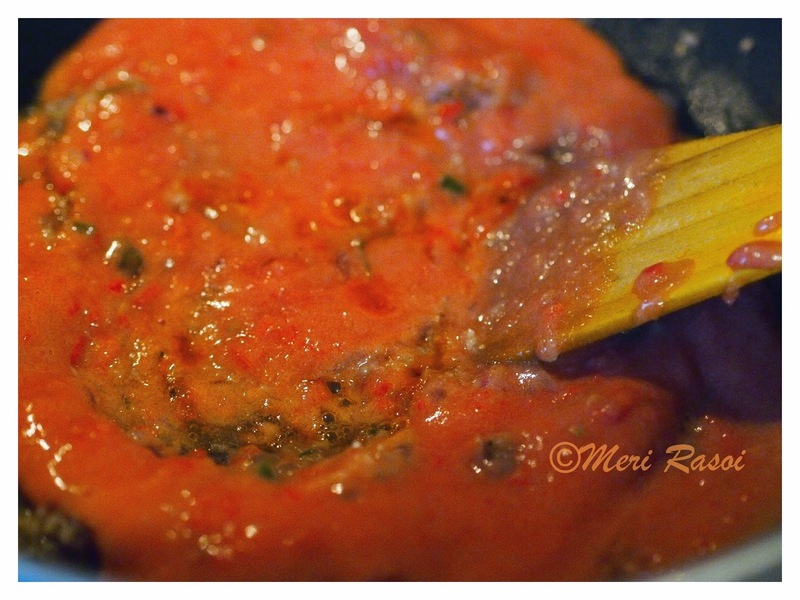 Add tomato puree and cook till oil starts to ooze out from the edges. 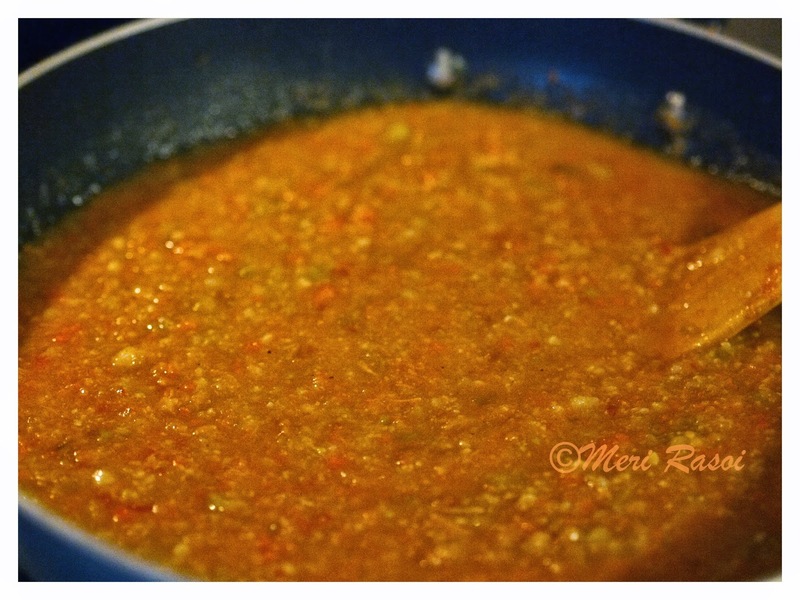 Add the pav bhaji masala at this point and cook the mixture for 5-7 minutes. 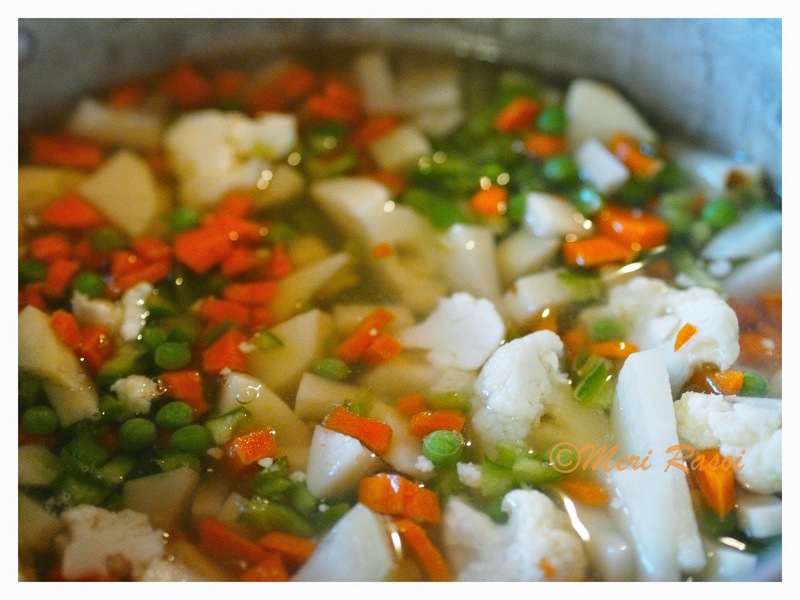 Now add the cooked and mashed mixed vegetable mixture and mix well. 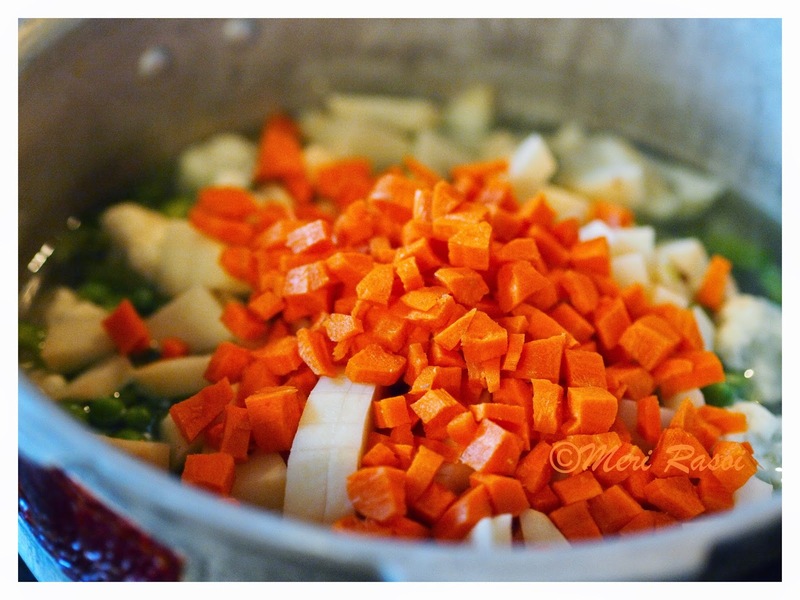 Adjust the consistency of the dish at this point. Add salt. Cook covered for a 10 -15 minutes over medium heat. Lastly add butter and cilantro and give it a final mix. 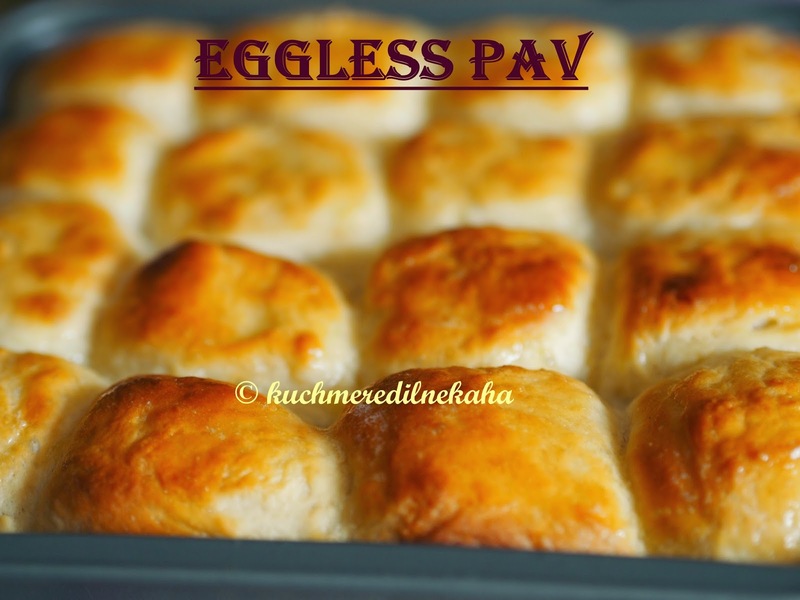 Once you have the pavs ready, you will need to lightly toast them in butter. Heat a pan. Slit the pav horizontally but not completely till the end. 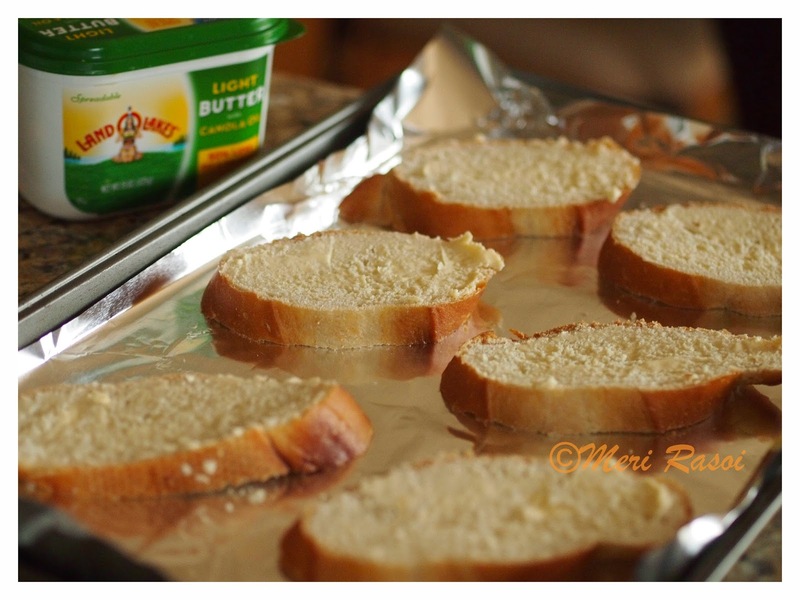 Apply some butter in the center as well as on the top and toast them on the hot pan. Serving Suggestion : Serve Hot Bhaji with a dollop of butter and garnish with some chopped onions and cilantro and lemon quarters on the side. 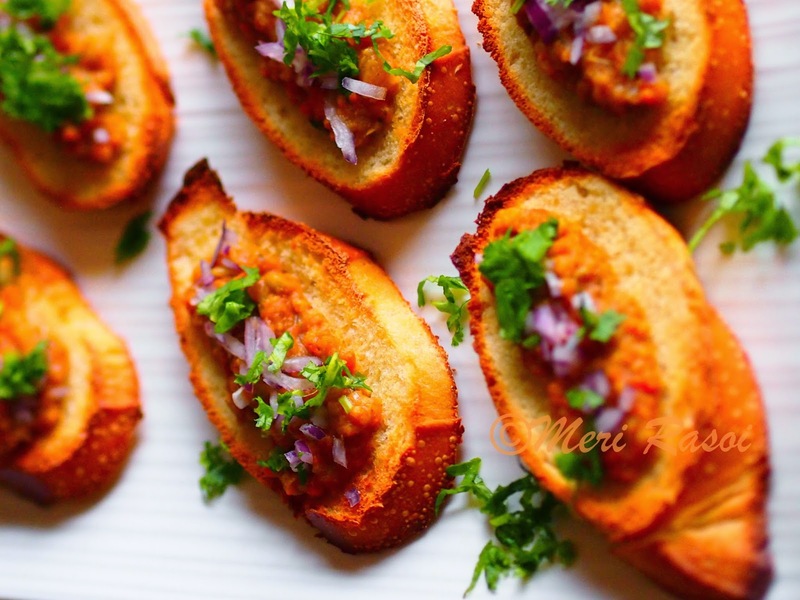 Squeeze some lime juice on the Bhaji and enjoy the spicy bhaji with buttered and toasted bread rolls. 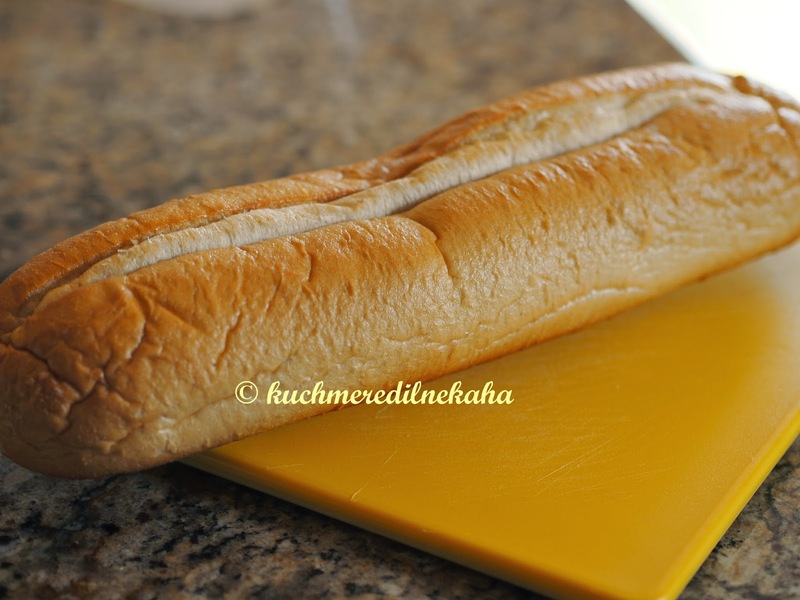 To begin with,you will need 1 french bread. 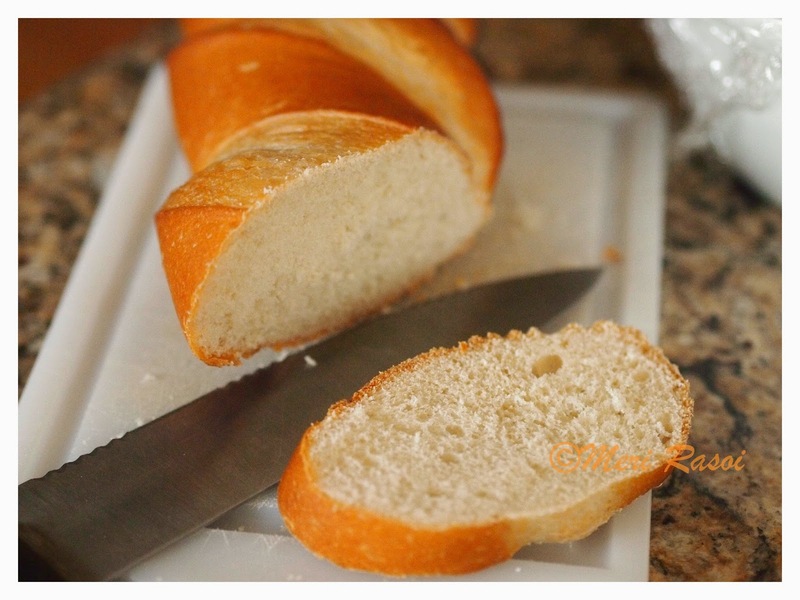 Slice the french bread at an angle. Preheat the oven to 425 F. Apply butter on the slices and bake them in the oven for 6 minutes (or until the breads have toasted well). You can toast them on the pan as we did with the pavs earlier . 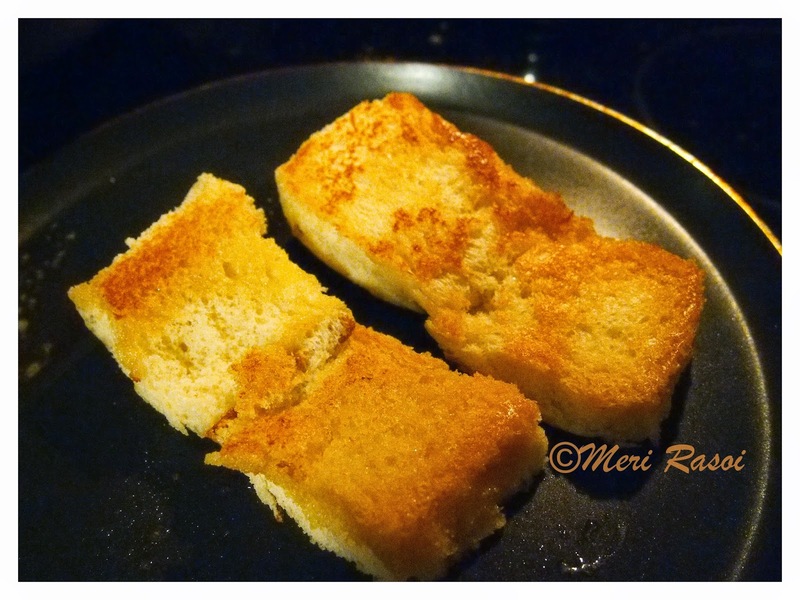 Once the bread has been toasted, arrange them on the serving plate. 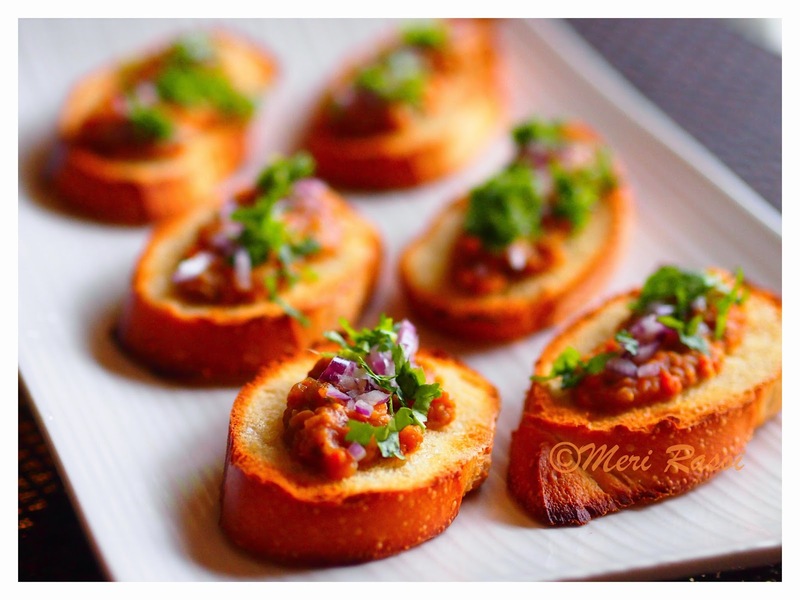 Spread some hot bhaji and garnish with chopped onion and cilantro. Lastly squeeze some lime over it.